This is a particularly hard Torah portion for me. Nadav and Avihu, the sons of Aaron, are in some way misbehaving. It's really not clear what they do wrong, but God is displeased. A fire consumes them. The whole community mourns for Nadav and Avihu. But Aaron and his family are told to refrain from any mourning. "Aaron was silent," is perhaps one of the most chilling phrases in the Torah. And yet...in some ways I can see it. When our Sammy died, we were the ones left with the gaping hole. We, his family and loved ones. And there was a whole community that mourned for us. Did we mourn too? Of course. And we still do. But often, we were the ones who kept silent so that others could speak, and often we were the ones who bit our tongues with held-in laughter when we knew something was deliciously funny, but only to our family. We are the silent mourners, because we continue to mourn, even today, even 829 days later. Like Aaron, we might be quiet about it. But that doesn't mean the river of grief has run dry. Today, there's a different way to be "noisy" or "silent." 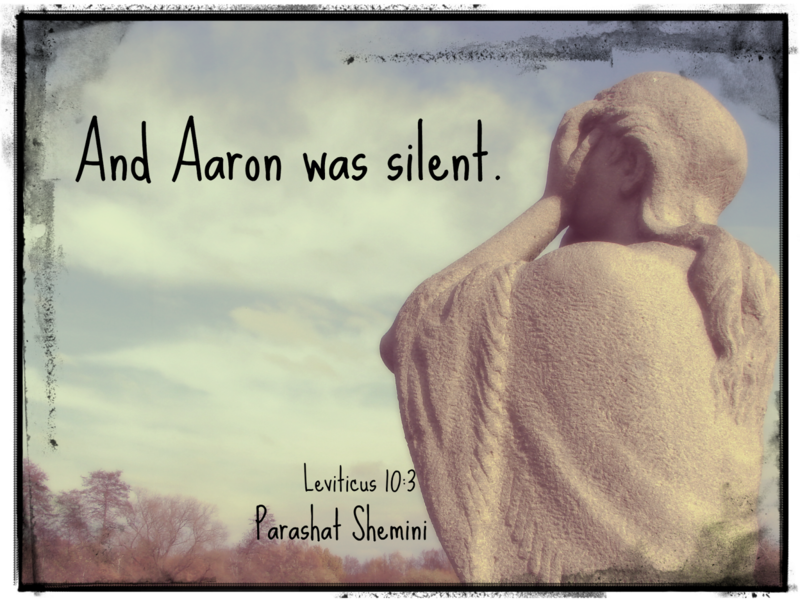 In today's palance, perhaps Aaron wouldn't have posted much about his sons' deaths on Facebook, and perhaps he might not have posted reminiscences of their childhoods or their funny stories...perhaps his silence was a reticence to share, publicly, the chasm that had opened up inside of him. Perhaps he was a lurker, watching the happy stories of others from afar, holding onto his own inner pain. Perhaps the silence is there to remind us that everyone has pain. Sometimes you can't see it...but it's there. I remember at the terror attack how there was suddenly silence, or my hearing just dried up. I also remember silence when I had to do the heimlich on my son to get out the ice cube he was choking on. What's an Ima? What's a Bima? Ima is Hebrew for "mom." Bima is the platform from which a Jewish prayer service is led. Rabbis typically stand on the bima to lead services. Want to hear the other guy's perspective? Check out my husband, the Abba Sababa. Follow me on GoodReads to see what I'm reading in 2017. All this stuff is copyright Rabbi Phyllis A. Sommer. Picture Window theme. Theme images by konradlew. Powered by Blogger.